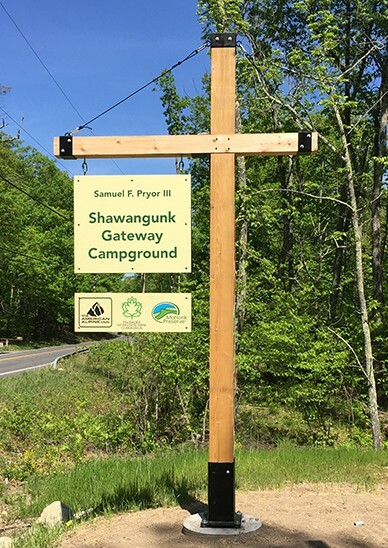 This Gunks campground, opened in May 2015, is managed by the American Alpine Club and the Mohonk Preserve. It’s the closest campground to the Gunks, on Rt. 299 just past the MUA campground. It has 50 tent sites with a limit of 4 people per campsite, maximum of 2 2-person tents per campsite. No RV’s or large vehicles allowed. Amenities include pay showers, covered pavillion, fire ring, drinking water and more. 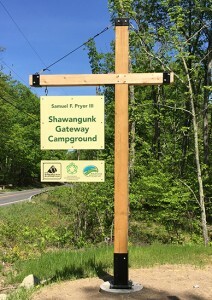 For prices and more information, see the American Alpine Club Gunks Campground web page, or their Facebook page. A small, private campground north of the Gunks with tent sites and full hook-ups for RVs and campers. Tent camping is $20 per site for 1 or 2 people. See website for most up to date costs. Open from March 15 to December 15th, see website to confirm exact dates. RV and tent sites, pool, wi-fi, unlimited hot showers, playground, mini-golf, paddle boating. Tent sites are $30 per day for 1 or 2 people, $15 for additional people (under 12 free). See website for most up to date costs. Season runs from May 15th to October 15th, see website to confirm for exact dates. Big family style campground with swimming pools, playground, arcade room, outdoor sports courts, wi-fi, bike rental, NYC tours, mini golf, snack bar, cable TV, fishing and various family activities. Tent sites, RV sites and cabins for rent. Camping age restriction of 25 years old and older. Tent sites are 2 night minimum, and will cost around between $38-57 per day. Fees for additional adults, children over 5 or pets and a $6 resort fee per site. See website for most up to date costs. Season runs from March 25th through October 31st, see website to confirm exact dates. A family campground/resort with swimming pools and a water playground, laser tag, jumping pillows, playground, outdoor sports courts, mini-golf, tubing/kayaking on the Wallkill and more. They have tent sites, cabins and RV hook-ups. 1 camping unit and 2 cars per site (extra vehicles $5). Limit 8 people per site, Over 4 may be subject to extra person fees. Must be 21 of over to rent campsite or cabin. No Pets at tent sites. Tent sites are in the $50 to $99 range, depending on mid-week or weekend or time of year. Day visitor fees. See website for most up to date costs. Season runs from April 29th through October 30th, see website to confirm exact dates. 2 night minimum on all campsites. 3 night minimum during holiday weekends. The Gunks MUA Campground – CLOSED! UPDATE: The MUA Campground has CLOSED on May 3, 2016! The Gunks Multiple Use Area Campground or MUA on Rt. 299 was a primitive free camping area managed by the New York State Department of Environmental Conservation. There were 9 primitive camping sites, limited parking and a portable toilet. With the opening of the AAC Campground, “Camp Slime” near the steel bridge is officially closed.